This pretty postcard design is every bit the charming and elegant wedding invitation that Brides dream of! Delicate floral patterns, modern typefaces and a whole range of beautiful colours to choose from, the Decorative Birdcage invitation from Ditsy Chic is a popular choice amongst couples looking to invite their guests to their wedding in style! You’ll notice that the focal point is an ornate vintage birdcage, finished off with a tassel and and four little love hearts in the middle which collectively read ‘Love’. At the top two tiny birds flutter either side of a larger heart – a symbol of two people coming together in love, signifying your wedding day. Cute! A scalloped-edge border surrounds the most stunning leafy illustrations to create a unique feature. With 56 colours to choose from, you can be sure you’ll find one to suit your colour scheme; chocolate or mocha would be the perfect choice if you’re going for an Indian or bohemian theme as the pretty design would look just like henna! There is a ‘worn’ effect to the ink which creates a rustic and timeless feel. We’re imagining your wedding venue full of eclectic decorations, featuring vintage bird cages enhanced with pretty delicate flowers, bunting, hessian table runners and a homemade three tiered ‘naked’ wedding cake complete with fresh strawberry jam and gloriously sinful buttercream, finished off with wild edible flowers and fresh berries! Your guests will find the all important wedding details digitally printed on the reverse of the 300gsm postcard which features the same gorgeous illustrations. This design could easily pass as a bespoke wedding invitation, so get ready to answer Grandma Betty when she says ‘These must have cost a fortune!’… your secret is safe with us! 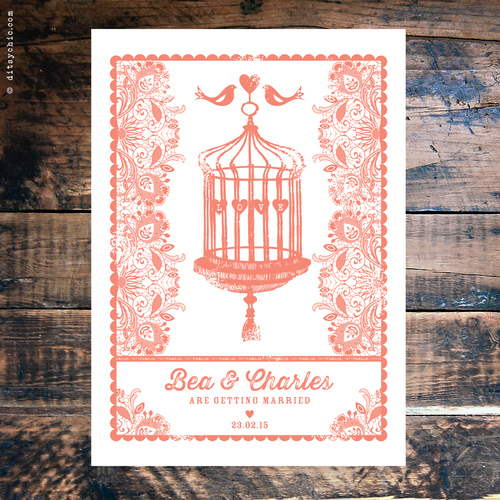 Tags: Birdcage, Coral, Eclectic, Love Birds, Rustic.